Top Hat Magic Classic Slot Review - Casino Answers! Top Hat Magic is a 3-reel, 1-line classic slot machine developed by Cryptologic, featuring bonus prizes. You can play the Top Hat Magic classic slot machine at [Americans: Unfortunately due to legal restrictions you are unable to play at any of the online casinos this game is at. We recommend you trying playing the unique slots at Win A Day Casino instead.]. Coin values on the Top Hat Magic slot machine are $0.25 and $1. You can bet 1-3 coins on the Top Hat Magic classic slot machine. You can bet as little as a quarter or as much as $3. Top Hat Magic has a low betting range that is great for casual players. To play Top Hat Magic, select your bet with “Bet One” and press the “Spin Reels” button. To play all 3 coins (recommended), press the “Bet Max” button. The highest paying symbol on the Top Hat Magic online slot machine is the Top Hat symbol. Land 3 Top Hat symbols on the payline in Top Hat Magic and you will win the 500 coin top jackpot. Every time you hit a winning combination on the Top Hat Magic slot machine, you will win a bonus hat that will be added to the Bonus Accumulation chart. Once you have 3 bonus hats, you will win the bonus prize attached to the symbol. For instance, once you have hit the Playing Card symbol winning combination 3 times, you will win 5 coins. The top prize is 3 Top Hat winning combinations, which will win you 1000 coins. This feature is enabled on maximum bet spins only. You can win lots of bonus cash from this special feature when you play at [Americans: Unfortunately due to legal restrictions you are unable to play at any of the online casinos this game is at. We recommend you trying playing the unique slots at Win A Day Casino instead.]! Top Hat Magic has a simple autoplay mode. You can select from 1-99 autoplay spins. Simply use the arrows to select the number of spins you wish to play then press either the “Spin Reels” or “Bet Max” buttons to start the autoplay mode. You can cancel the autoplay mode at any time by pressing the “Stop” button. 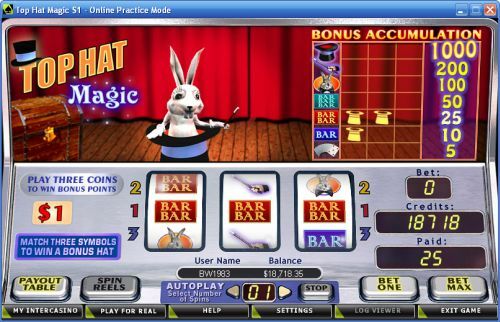 Top Hat Magic has better presentation than many Crypto classic slots, but it still isn’t the greatest. Its payouts aren’t too hot either, but at least the bonus feature is something unique and innovative. You can play the Top Hat Magic slot machine when you sign up at [Americans: Unfortunately due to legal restrictions you are unable to play at any of the online casinos this game is at. We recommend you trying playing the unique slots at Win A Day Casino instead.]! Can USA players play the Top Hat Magic slot game for real money? 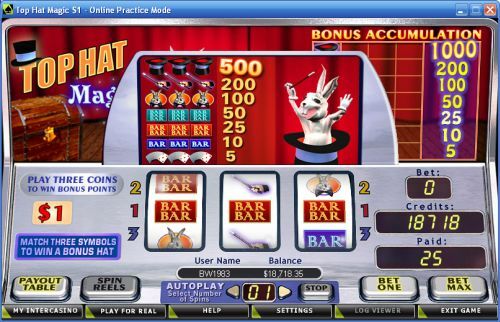 No, American players cannot play the Top Hat Magic online slot game for real money. For some USA-friendly slots, we recommend you pay a visit to Bovada.